December 29, 2010 - A 27-year-old U.S. citizen was taken into custody by U.S. Immigration and Customs Enforcement's (ICE) Homeland Security Investigations (HSI) Saturday after U.S. Customs and Border Protection (CBP) officers discovered he was carrying 49 pellets of heroin, with an approximate weight of 1.54 pounds, in his digestive tract. Rony Rincon Pineyro, arrived Saturday at the Luis Munoz Marin International Airport from La Romana, Dominican Republic and was referred to a CBP secondary inspection where he consented to an X-ray examination. 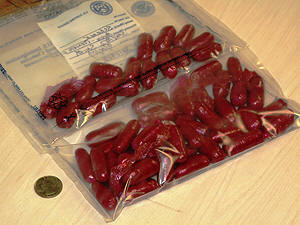 He later admitted swallowing narcotics pellets but denied knowing the number or what they contained. CBP officers transported Rincon Pineyro to a medical facility for an X-ray examination by a certified technician who verified the presence of foreign objects in his digestive tract. By Monday morning, Rincon Pineyro had expulsed 49 pellets which tested positive to heroin. The estimated street value of the seized heroin is $45,000. As a result of the Department of Homeland Security, tightening inspections at U.S. ports of entry, smugglers are taking more chances to try to bring in dangerous drugs and contraband. An internal carrier or ?swallower? is an individual that ingests narcotics in the form of pellets that vary slightly in weight and size made from the fingers of rubber gloves and prophylactics which are swallowed in order to transport the narcotics undetected to pass later at their final destination. It is not unusual for experienced swallowers to ingest as many as 100 pellets. Internal smuggling is an extremely dangerous concealment method for the carrier. Carriers have died after narcotics pellets have breached while inside them. Internal carriers put their lives at great risk as it is not uncommon for the pellets to leak during transport, which could result in the individual?s death. ?Through our border security efforts, CBP remains vigilant to interdict dangerous and illegal drugs,? said Mike Denning, CBP?s assistant director of border security for the Atlanta region. "Although the dangers involved in the smuggling of contraband sometimes receives less attention than the danger to end-users of illegal drugs, the risks are every bit as real." Recently an individual was found unconscious upon arrival in the United States from South America. The individual died and at this time a cause of death has not been officially determined. However, the individual was found to be an internal carrier who attempted to smuggle into the United States more than 35 ounces of heroin contained within 75 pellets. U.S. Immigration and Customs Enforcement special agents are conducting an investigation into the circumstances surrounding the illegal importation of the narcotics.